The Człuchów was a well-developed settlement as early as the Middle Ages. Which afterwards, under the first monarchs from the House of Piast, Człuchów belonged to the Castellany of Szczytno in Kashubia. Around 1290 the land around Człuchów was ceded by the Duke of Gdańsk Mestwin II to the voivod of Calisia Nicholas of Poniec. In the 1312 his sons sold Człuchów to the Teutonic Knights, who valued the strategic assets of the village and decided to build here a powerful castle. This place was important for the Teutonic Knights as it was located at the junction of the roads leading from Germany to Malbork. And besides, Człuchów was near the borders of the Teutonic State with the Kingdom of Poland and West Pomerania. 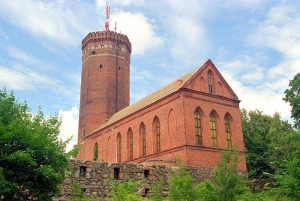 The construction of the castle proceeded smoothly and around the year of 1365 it became the strongest in the possession of Teutonic Knights, the second one after the Malbork castle. The castle compound in Człuchów consisted of the main castle, known as the High Castle, and three built-up wards: west, north and east. The whole compound was surrounded with enormous fortified stones and brick walls. During its most glorious times, the castle had eleven gates and nine towers (until our days, only parts of the outer walls, the wall surrounding the inner ward and some remnants of two towers - beside to the Louise Gatehouse and the Witches Tower - have survived). The castle also had an extensive system of moats, drawbridges and three types of dungeons, which were the medieval prisons. Owing to the knights and mercenaries who stopped by Człuchów, the settlement transformed from a modest village to the larger village, which on the 19th., of June 1348 the Grand Master of the Teutonic Order, Heirich von Dusemer, granted civic rights for the Malbork. 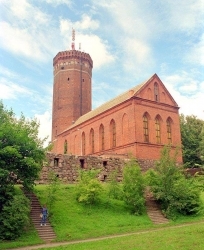 The presence of the castle meant that Człuchów never had its own fortifications. Which meant that the town was frequently looted and burnt. In later years, the King of Prussia Frederic Wilhelm II, gave his permission to demolish the castle in order to rebuild the town ravaged by two great fires-consumed (in 1786 and 1793). 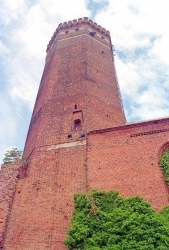 The residents of Człuchów just did not know how to dismantle the tower, because of its height and at later converted it into a church belfry, having first built a Lautheran church adjacent to it in 1825. The XIX century brought to the town some small industry, oil lighting, followed by gas, and finally electricity, road and railway links and a double storied office buildings of offices and institutions. Człuchów joined again the Poland on the 27th., of February 1945. As a result of the war destroyed about 60% of the buildings of Człuchów. The town gradually regained its former importance: cobbled streets, new houses were built, set industries, sawmills, schools, and the railway line was re-opened, developed the park and its surroundings. Text on which translation was based thanks to Stowarzyszenie Gmin "Polskie Zamki Gotyckie"